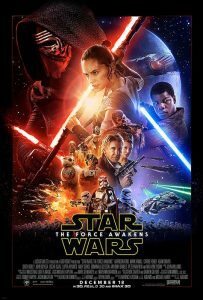 No doubt you have heard about the much-anticipated new movie in the Star Wars franchise. In its first three weeks at the box office, it has shattered records everywhere, and been a hit with audiences and critics alike. As he has done with the most recent films in the Star Trek franchise, director J. J. Abrams has gone back to the source, and revived what made the original Star Wars movies such a sensation. The Force Awakens begins rather slowly. It is 30 years after the original Star Wars. The Empire has been defeated, but now a new evil empire, called The First Order, is in control of much of the universe. Luke Skywalker has gone into self-imposed exile, after the last Jedi Warrior he trained, Kylo Ren, son of Han Solo, has gone to the Dark Side. With Luke, the last Jedi Warrior, still around, there is always the possibility that he will come out of exile and train more warriors. Therefore, the First Order is out to capture Luke, so there will be no threat to their power. The first part of the movie involves Poe, a rebel fighting the First Order; Finn, a storm trooper who defects; and Rey, a scavenger. It is all only mildly interesting until the appearance of Harrison Ford, as Han Solo, and Chewbacca, everyone’s favorite wookie. It is amazing that, at 71, Ford still has the energy and charisma to energize the movie. Not long after, Carrie Fisher appears as Princess (now General) Leia. Although Leia and Han are no longer together, they still appear friendly, and are concerned about the fate of both Luke (Leia’s brother) and Kylo, their son. As with the earlier movies, family dynamics still play a major role in The Force Awakens. And, of course, those lovable droids C-3PO and R2-D2 return, albeit late in the movie, for our enjoyment. After the appearance of Han and Leia, the movie seems so comfortable and familiar, it is almost like watching the original Star Wars all over again! Composer John Williams wrote the score, which includes much of the original music. Lawrence Kasdan, writer of The Empire Strikes Back, co-wrote the screenplay, along with Abrams. There are saber fights, father-son conflicts, and exploding planets galore. It is all good fun, even if, too often, it seems a bit too much like the original, with Daisy Ridley (Rey), John Boyega (Finn) and Oscar Isaac (Poe) channeling Luke, Leia, and Han. And even Kylo resembles a young Darth Vader, all dressed in black. Only Obi-Wan Kenobi and Yoda are missing, although a new character, Maz Kanata, is very Yoda-esque in wisdom and appearance. So, for the few of you who are still waiting to see it, go out and have a couple of hours of fun with familiar friends from the past. May the Force Be With You!